Our office location is on US Route 3, at Happy Corner, 5 miles north of Pittsburg village. It is 3/4 mile to First Connecticut Lake and 17 miles to the Canadian border. We are centrally located for all the lakes, ponds, streams and moose watching areas. 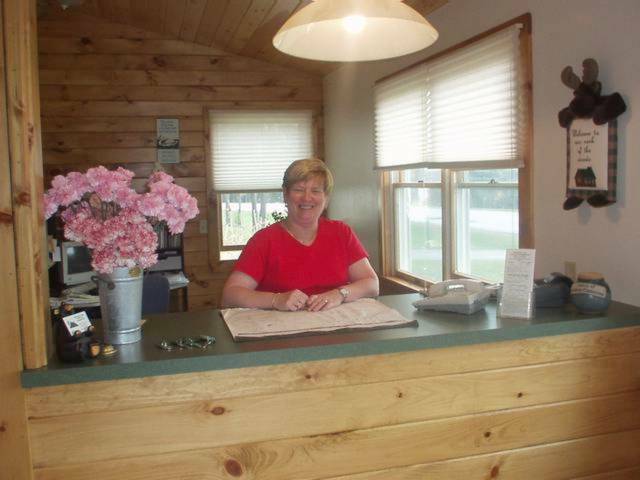 We are at the heart of the snowmobile trail system where Young's Store, Happy Corner Cafe and the cabins and campground are located. Reservations must be confirmed with a deposit on a credit card or by check. Cancellations must be received 14 days prior to arrival date for a refund of the deposit. There is a $10.00 cancellation fee. If less than 10 days notification is given, a refund will only be issued for the days rebooked. The only exception to this policy is for our winter guests if the trails have been CLOSED by the Pittsburg Ridge Runner Snowmobile Club. Also note, some cabins have a required minimum number of guests and/or length of stay. Pets are welcome at Mountain View but must be kept on a leash and cleaned up after. No pet is to be left unattended in a cabin or in the campground. There is a $8.00 charge per animal, per night. There will be an additional fee of $50.00 if you do not clean up after your pet and any damage to the cabin will be charged to your bill. We at Mountain View are Pittsburg natives. The business has been family owned since it opened in 1954. Quality service and customer satisfaction has been and continues to be our trademark. We guarantee you clean, comfortable and affordable accommodations.